Our new record These Wicked Things is getting rave reviews...do you have your copy yet? Order today on Bandcamp in digital, CD, or 180g vinyl formats. Here's what the press is saying... "A masterpiece of atmosphere, evoking dark, strange corners of the American experience." -- Mark Sullivan, 4.5/5 stars in All About Jazz "Beat Circus is a bona fide Boston music institution...one part edgy, eclectic art ensemble, one part twangy, moody roots-rock outfit, combined in an instantly appealing mix." -- Steve Smith, National Sawdust "Impressively put together as a holistic work, with lots of production-based ear candy...a thoroughly enjoyable and rich album." -- Andrew Marrocco, Spill Magazine 8/10 stars "Full of surreal audio landscapes put together in strange and often unsettling ways" - John Schaefer, WNYC New Sounds "An excellent album, buzzing with ideas and unrelentingly following its dark muse" -- Jonathan Aird, Americana UK, 8/10 stars "A sound scavenged from a virtual musical bazaar — from noir jazz and dark cowboy soundtracks to steampunk chamber music and gringo mariachi, with stark, black-and-white illustrations from graphic novelist Danijel Zezelj" -- James Sullivan, Boston Globe "Spoken-word tales and musical narratives of death, darkness and dashed dreams..." Great review by Darryl Sterdan of Tinnitist "With an excellent choice of collaborators (guitarist Andrew Stern particularly shines), Giant Sand, Calexico and Neko Case producer Craig Schumacher, the biggest chunk of the parts go to Carpenter himself, with deadpan vocals and all of the instrumental embellishments he put in himself." -- Ljubinko Zivkovic, Soundblab, 8/10 stars https://beatcircus.bandcamp.com/ 1 day 13 hours ago. Our new record These Wicked Things is getting rave reviews...do you have your copy yet?? Here's what the press is saying... "A masterpiece of atmosphere, evoking dark, strange corners of the American experience." -- Mark Sullivan, 4.5/5 stars in All About Jazz "Beat Circus is a bona fide Boston music institution...one part edgy, eclectic art ensemble, one part twangy, moody roots-rock outfit, combined in an instantly appealing mix." -- Steve Smith, National Sawdust "Impressively put together as a holistic work, with lots of production-based ear candy...a thoroughly enjoyable and rich album." -- Andrew Marrocco, Spill Magazine 8/10 stars "Full of surreal audio landscapes put together in strange and often unsettling ways" - John Schaefer, WNYC New Sounds "An excellent album, buzzing with ideas and unrelentingly following its dark muse" -- Jonathan Aird, Americana UK, 8/10 stars "A sound scavenged from a virtual musical bazaar — from noir jazz and dark cowboy soundtracks to steampunk chamber music and gringo mariachi, with stark, black-and-white illustrations from graphic novelist Danijel Zezelj" -- James Sullivan, Boston Globe "Spoken-word tales and musical narratives of death, darkness and dashed dreams..." Great review by Darryl Sterdan of Tinnitist "With an excellent choice of collaborators (guitarist Andrew Stern particularly shines), Giant Sand, Calexico and Neko Case producer Craig Schumacher, the biggest chunk of the parts go to Carpenter himself, with deadpan vocals and all of the instrumental embellishments he put in himself." -- Ljubinko Zivkovic, Soundblab, 8/10 stars https://beatcircus.bandcamp.com/ 1 week 1 day ago. Merci bien Patrick Foulhoux de Slow Show 1 week 3 days ago. Sound checking in Montreal tonight before returning to Boston. We’re in Providence this Thursday night with Alec K. Redfearn and then NYC Thursday the 25th at National Sawdust 1 week 6 days ago. Phenomenal and amazing show in Detroit tonight y'all!! Come back soon please! 2 weeks 21 hours ago. These Wicked Things is the fourth release from the determinedly eclectic Boston-based band Beat Circus and the final installment in singer/multi-instrumentalist/composer Brian Carpenter’s “Weird American Gothic” trilogy. The record bridges a number of disparate genres including experimental music, cowpunk, post-punk, Mexican folk music, mariachi music, and “spaghetti western” and giallo film scores. The cover and booklet include a 18-page graphic novelette by renowned Croatian artist Danijel Zezelj, best known for his live paintings, multimedia, and collaborations with DC Comics/Vertigo. 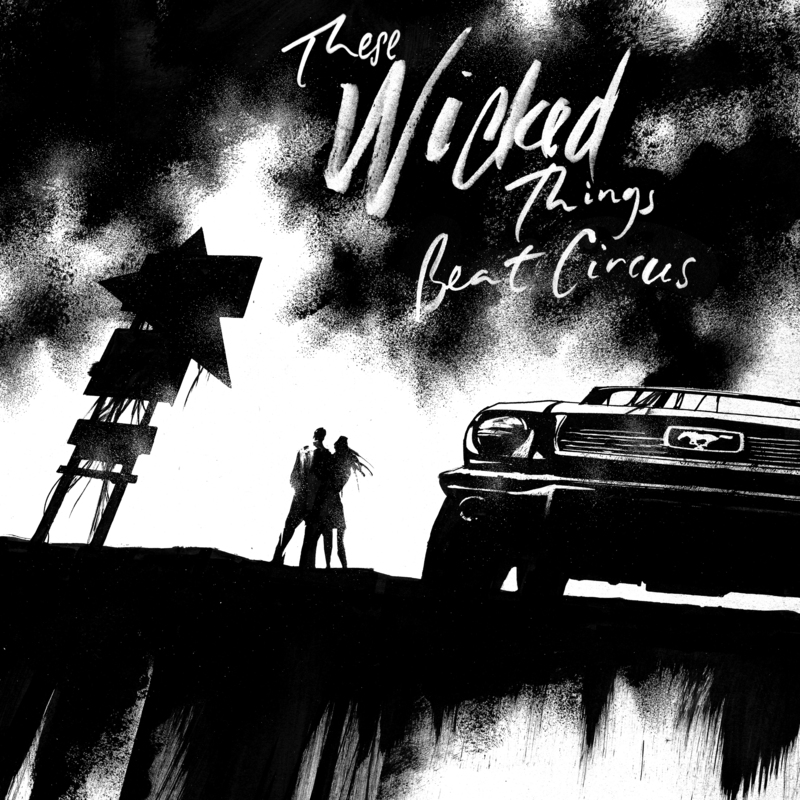 These Wicked Things began after Carpenter was commissioned by the Berkeley Repertory Theater in Berkeley, California to compose music and lyrics for Dominic Orlando’s play The Barbary Coast in 2014. Based on the true crime book by Herbert Asbury (Gangs of New York), The Barbary Coast detailed the violent rise of San Francisco in the late 1800s. The play centers around Joaquin Murieta, a Mexican who went on a revenge spree after his wife Rosita was killed by gold miners. Two versions of “Rosita” and some incidental music from the play are included. After recording These Wicked Things with Beat Circus at the legendary Q Division Studios in Boston, Carpenter flew out to Tucson, Arizona to mix the record with esteemed producer Craig Schumacher (Calexico, Neko Case, Giant Sand.) Carpenter worked with Schumacher previously on his singer/songwriter outing The Far End of the World (2015, Accurate.) Special guests on These Wicked Things include trumpeter Jacob Valenzuela of Calexico, bass saxophonist Dana Colley of Morphine, and guitarist Stephen Ulrich of the NYC guitar noir trio Big Lazy. Brian Carpenter formed Beat Circus in 2002 shortly after his arrival in Boston and since then, he's been the ensemble's guiding light and sole constant member. He has recorded or performed with Swans, Kronos Quartet, Colin Stetson, Marc Ribot, and Roswell Rudd, and collaborated with producers Martin Bisi (Dreamland, 2008), Sean Slade and Bryce Goggin (Boy From Black Mountain, 2009). Returning on These Wicked Things are drummer Gavin McCarthy (Karate, Thalia Zedek Band), bassist Paul Dilley (Ward Hayden & The Outliers), and guitarist Andrew Stern (Brian Carpenter & The Confessions). Relative newcomers include violinist Abigale Reisman (Tredici Bacci), violist Emily Bookwalter (Ghost Train Orchestra), and multi-instrumentalist Alec Spiegelman (Cuddle Magic), all three of whom worked with Carpenter on The Barbary Coastin San Francisco. These Wicked Things is the band’s first release in ten years, following Boy From Black Mountain (Cuneiform Records, 2009), Dreamland (Cuneiform, 2008), and Ringleaders Revolt (innova, 2004). During this period, Carpenter released four critically-acclaimed albums with Ghost Train Orchestra in Brooklyn, NY, and a debut album with Brian Carpenter & The Confessions.